In November 2018, we spend three weeks near Tarragona in Catalonia, as we have done many times already. On the way we have sometimes driven around Lleida. What a headache. Multilane avenues with endless traffic lights and complicated circuses amidst faceless multi-storey houses. I have always tried to get through Lleida as quickly as possible. 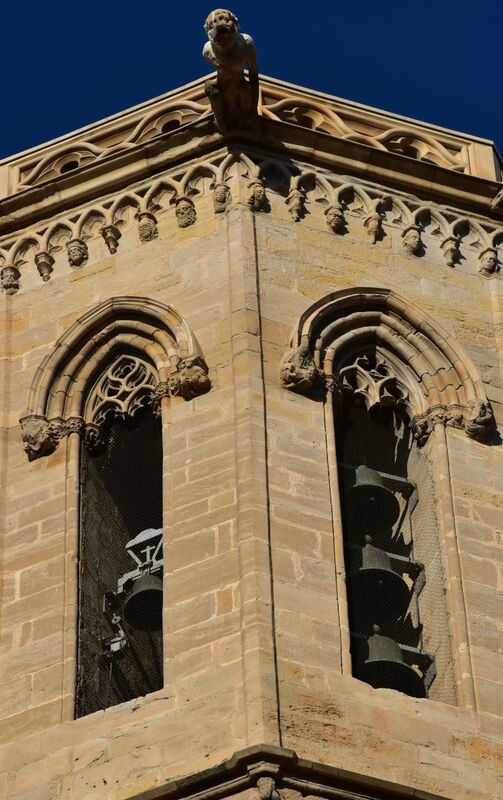 But… we read that the cathedral of Lleida is worth a visit and that the pedestrian zone around Carrer Major is pretty (Dumont and “newspaper”). 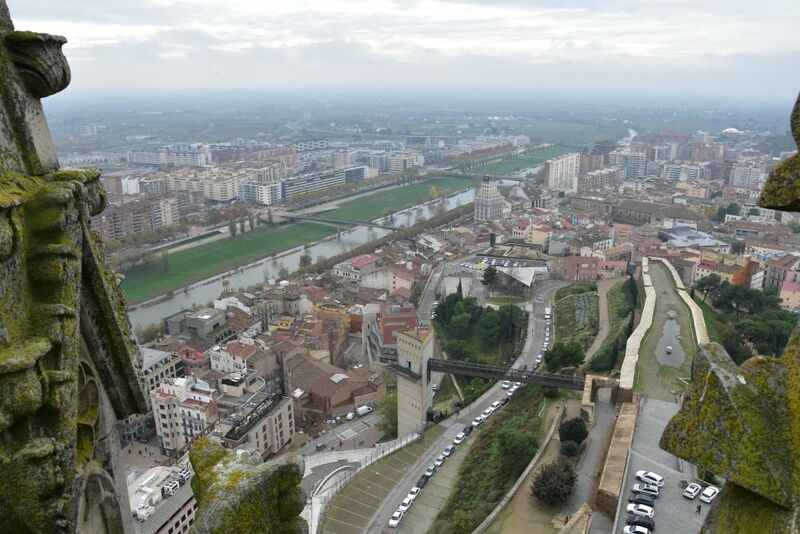 Hence we decided to visit Lleida. 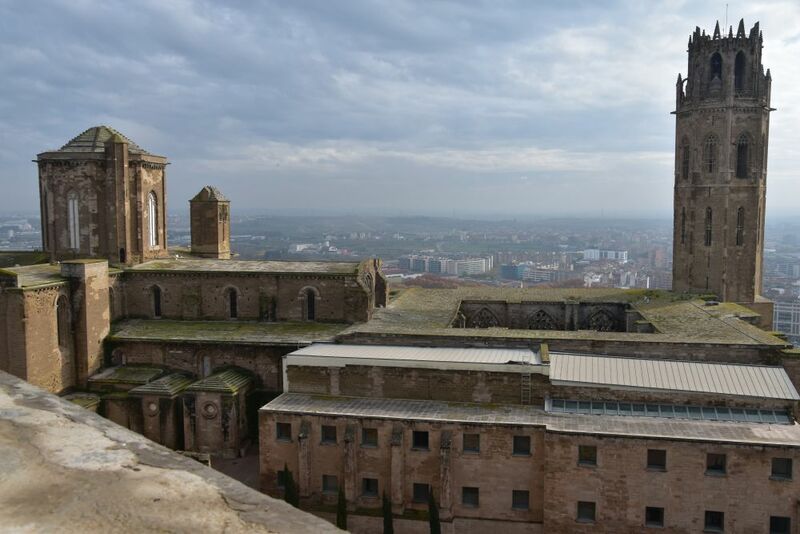 And yes, our sources are right, Lleida is worth a visit. 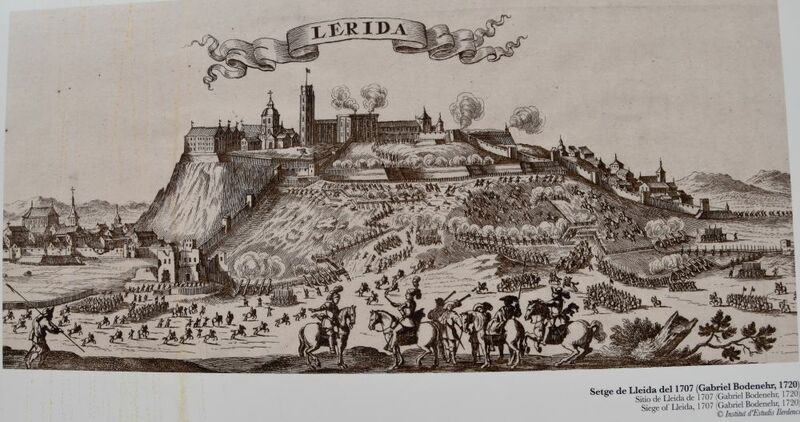 The engraving below shows the siege of Lleida in 1707, during the Spanish War of Succession. French troops fighting for the Bourbons attacked Lleida that – being part of Catalonia – had taken the side of the Habsburgians, as the latter were less centralistic than the French Bourbons (I suspect). Much of the cathedral was destroyed then and the complete top of the hill was turned into a fortification and a military casern (engraving found in the Museu de Lleida). 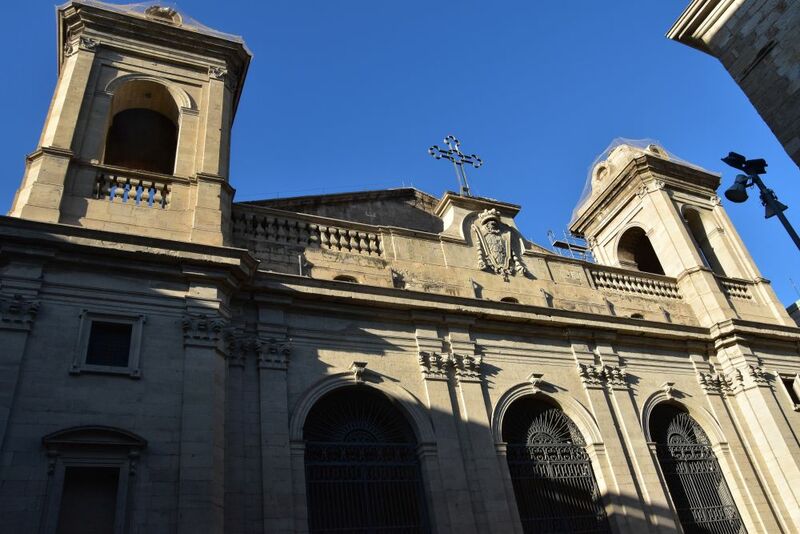 In the 1960’s, the army retreated and the restoration of the maltreated Seu Vella started, after all the destruction that had taken place since more than 200 years. The cathedral is surrounded by rings of thick walls, it still looks a fortification today. We had accessed the fortification using the lift in the triangular modern tower (a lazy mountain biker joined the two lazy ladies…). The wooden bridge had taken us from the lift to the fortification wall. The river below is the Rio Segre coming from the Pyrenees. 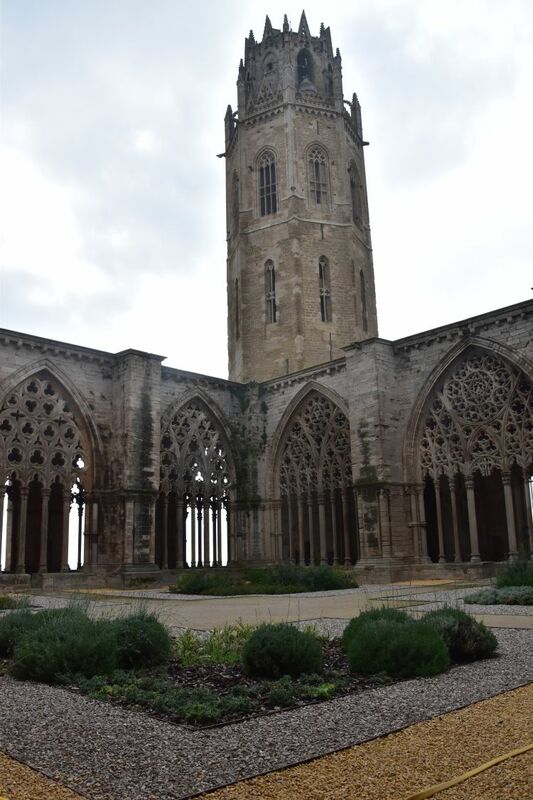 … and continues to the west with the marvellous cloister in pure Gothic style, as the views taken from the belfry show. In the background is the so-called royal Castle. 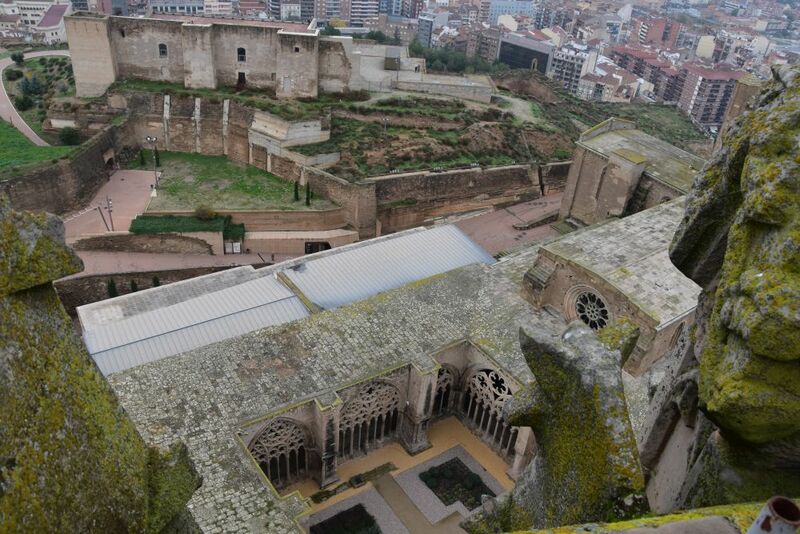 The unusual layout of nave and cloister can also be seen from the royal Castle. At the end of the 14th century, the octagonal belfry was added. It can be climbed, which requires taking some 280 huge steps winding up on narrow corkscrew stairs. It has never happened to me before that my muscles ached after having climbed a belfry, but the steps were somewhat unergonomic and high for a person as small as I am (twinkling…). The cloister is a masterpiece. 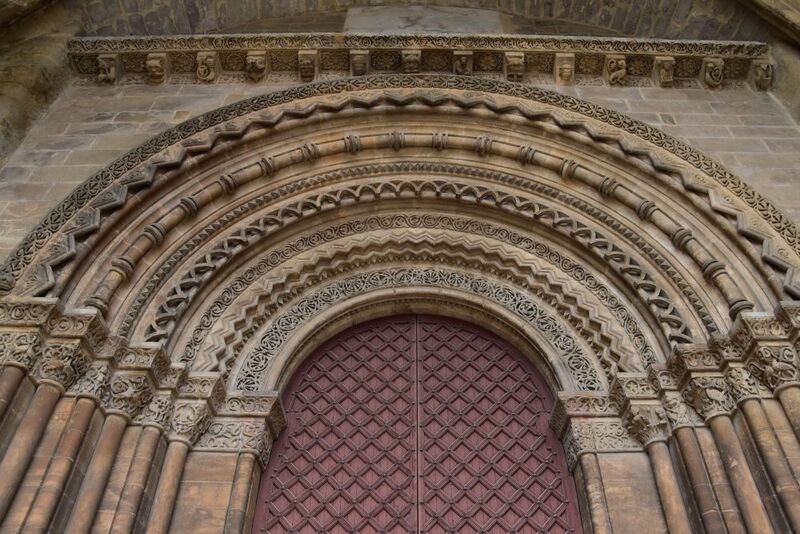 Each of the Gothic arches is differently chiselled, perhaps influenced by muslim architecture. 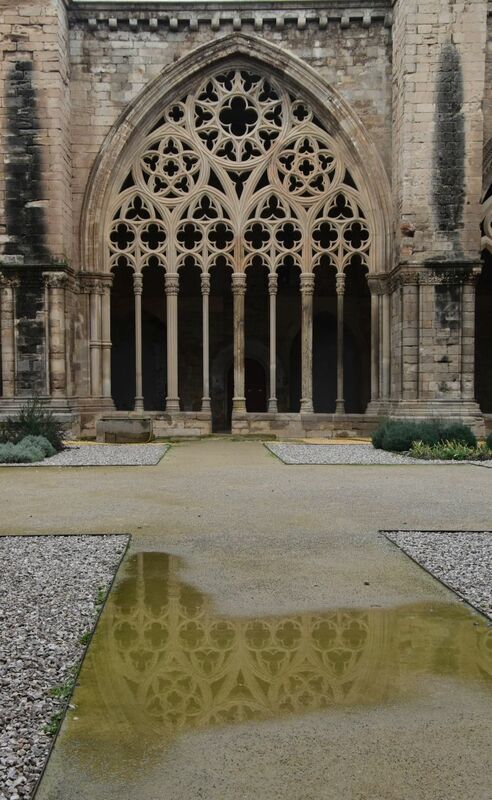 The rain has left puddles reflecting the fine arches. This arch attracts my attention: Something is hanging in the middle – very unusual. I have a closer look. It is a crucifixion with Maria to the left and the disciple John to the right. Some angels are surrounding the group. 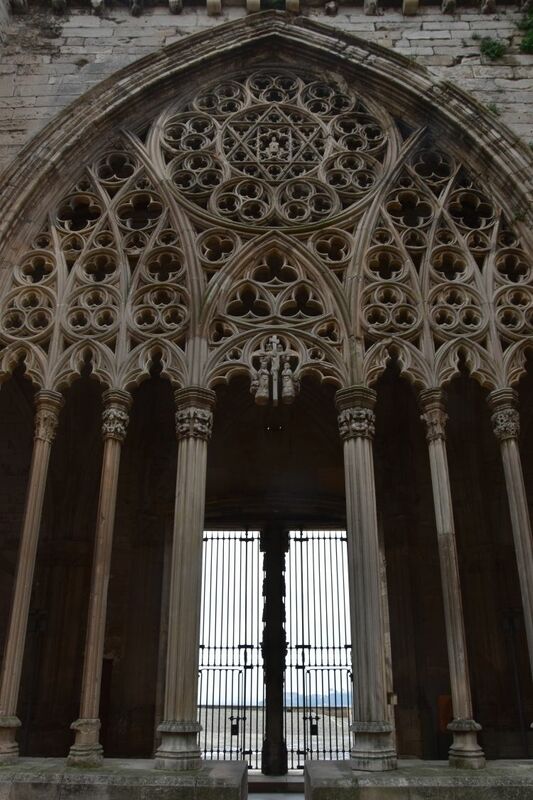 From the cloister, we enter the church with its ribbed vaults. 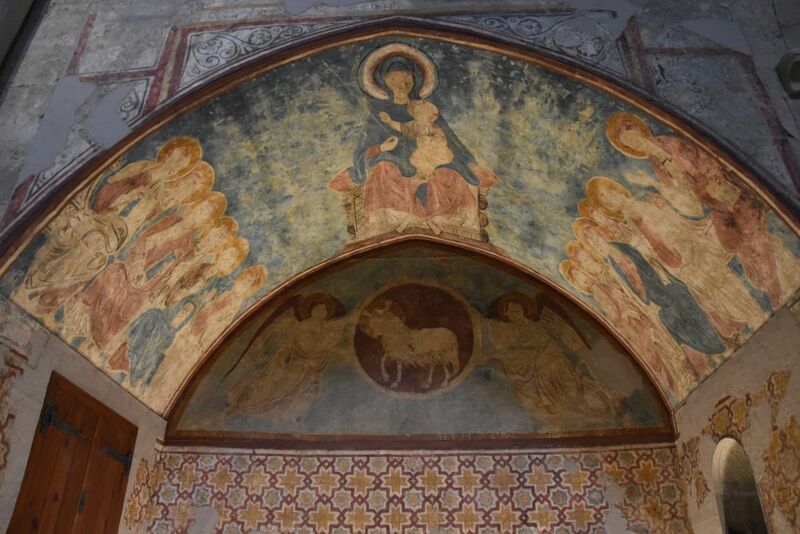 I am particularly attracted by this fresco with Maria in the middle. The decorated tiles below the fresco show a clear influence of the muslims that had just been exiled from here, when the church was built. We find many tomb slabs in the front area of the church. Ursula took photos of them. This head has been bedded on a comfortable cushion. … and two beautiful portals. This is one of them, the Porta dels Fillols. The decoration also shows muslim influence. From the cloister and from the belfry the view is marvellous, though on this grey day not up to the Pyrenees. 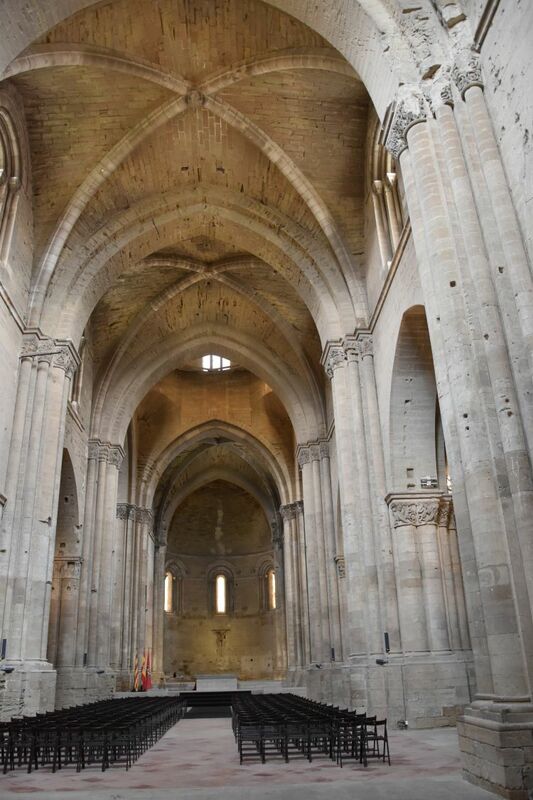 We have to come back on a clear day to see the Pyrenees and to visit the Seu Vella or old cathedral again – perhaps by then the book of the photographer-architect will have come out. 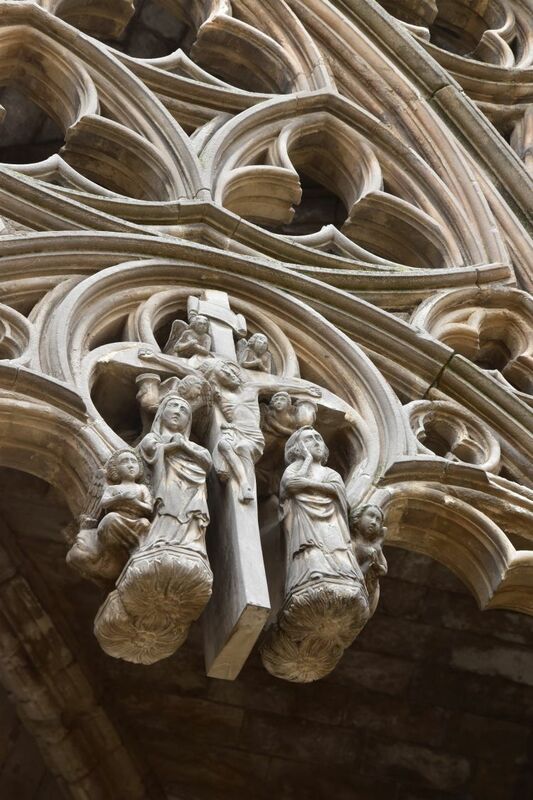 After having visited the old cathedral, we stroll along the Carrer Major and adjacent areas. 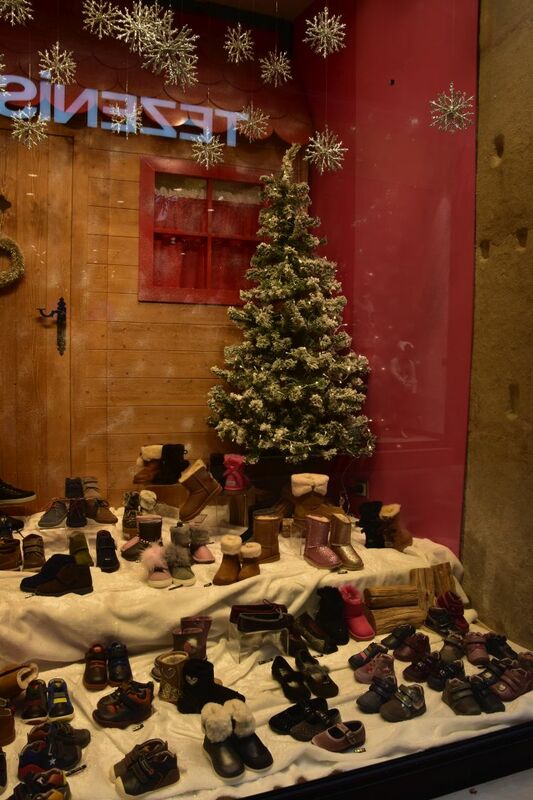 Christmas is ahead of us, as the decorations in the many clothing and shoe shops show. 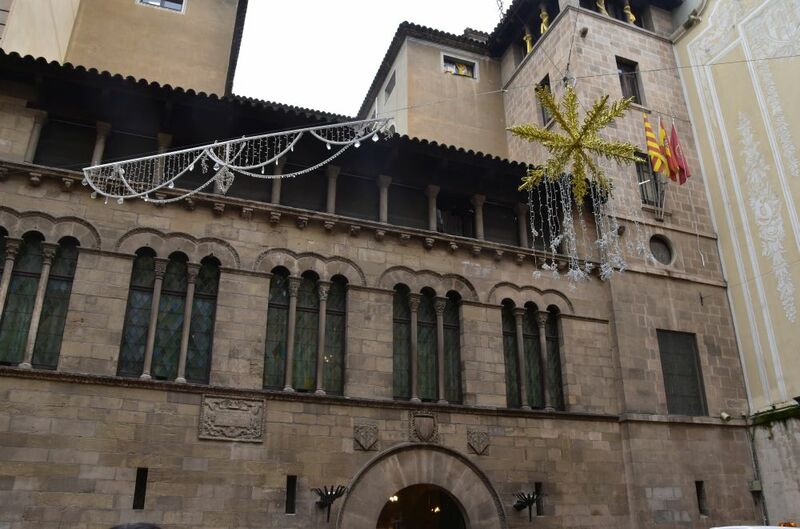 Also the Plaça de la Paeria with the Gothic townhall is decorated for Christmas. The wrought-iron lamps are next to the entry of the townhall. 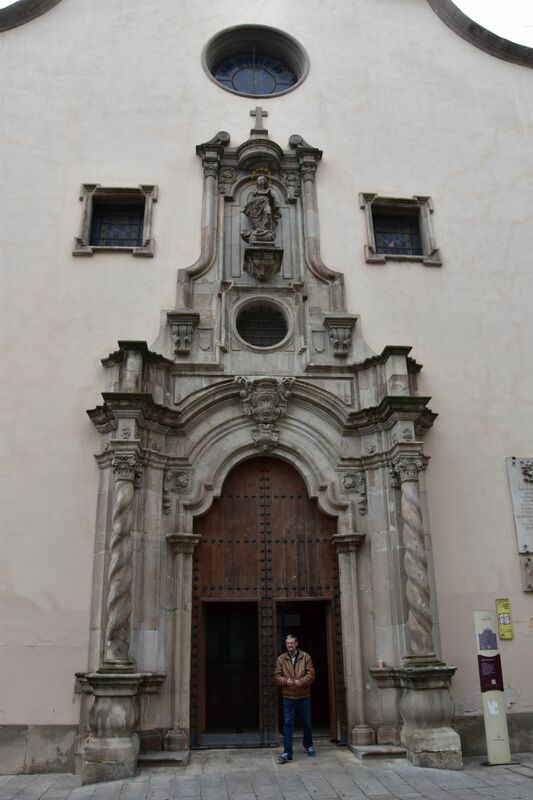 In the 18th century church Sant Pere, we find an old friend of ours, Gaspar de Portolá. 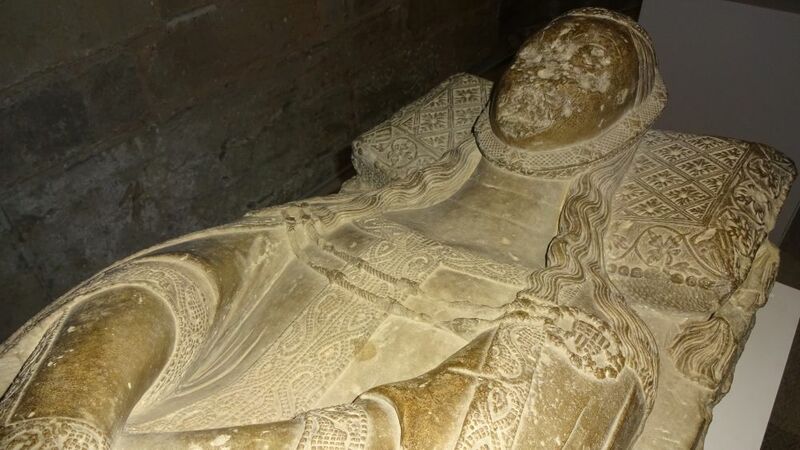 He is buried here. We know him from the Aran Valley in the Pyrenees where we have stayed four nights in the former Palace of the noble family Portolá – the palace is now a Parador. In the 18th century, Gaspar de Portolá set off to America and discovered San Francisco and the Monterrey Bay in California. 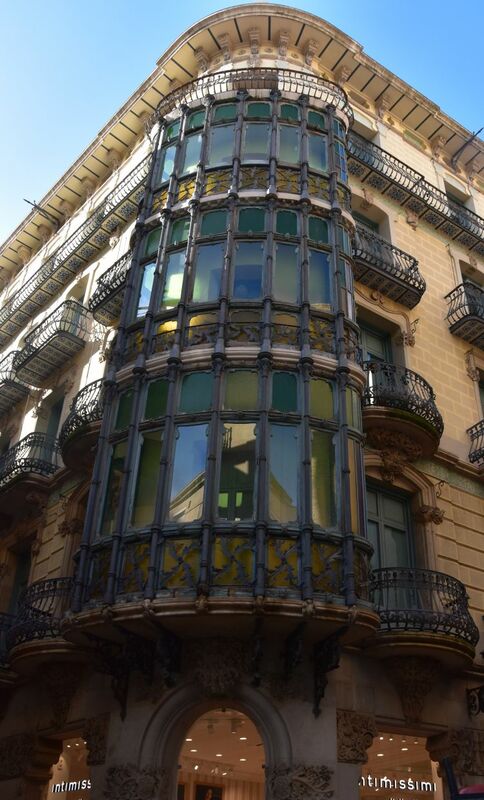 There are also quite a few Art Nouveau buildings in Carrer Major. 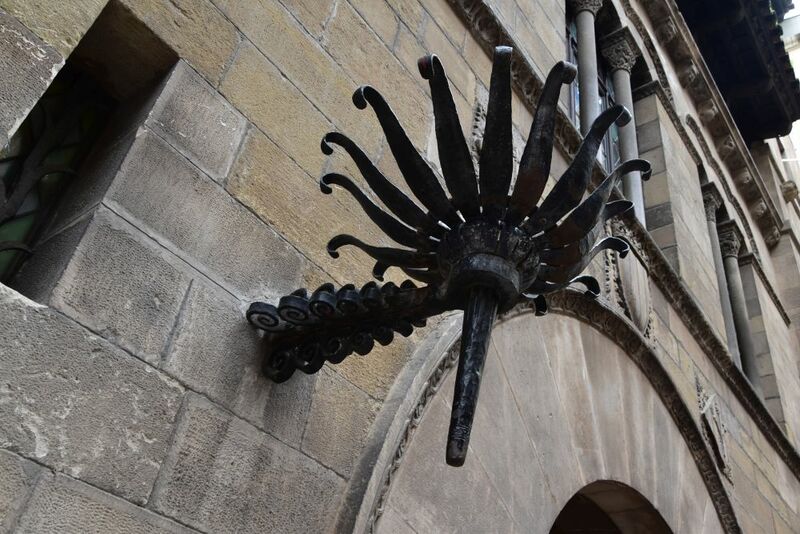 I love the fancy and playful Art Nouveau style in Catalonia – also outside of Barcelona. 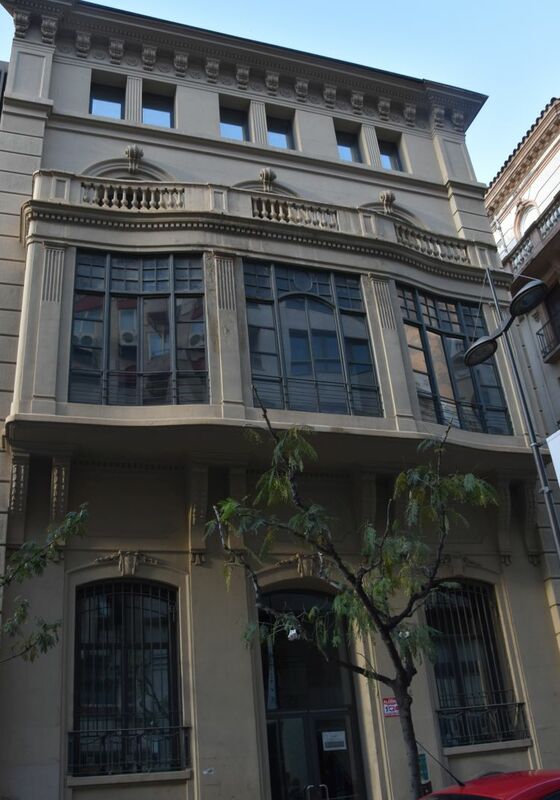 This house is called Casa Magí Llorenç (1918). And this is the Casal de la Joventut Republicana (built in 1919). Again and again we return to the Carrer Major to savour the buzzing atmosphere. 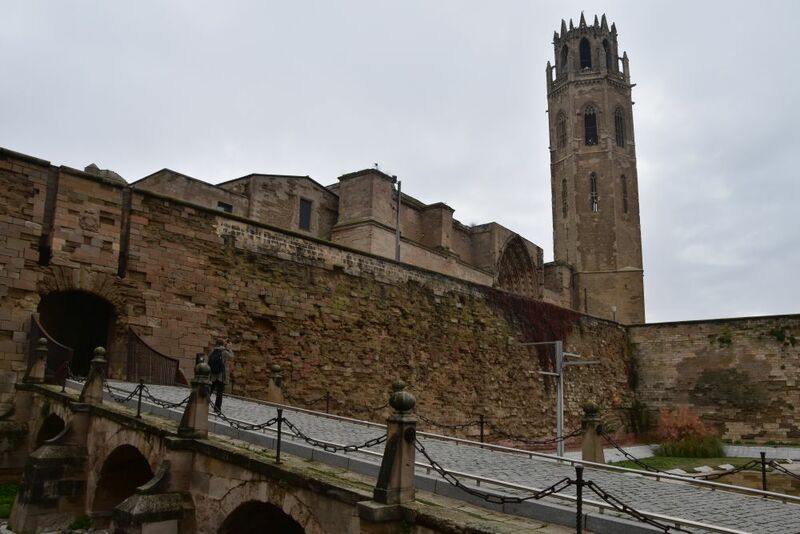 Outside the old city center we visit the Museu de Lleida to learn about the history of the region and of Spain. The museum starts with the first men and we get as far as the 15th century. Then the museum closes. The explanations are very instructive and we forget the time. Here are two take aways. 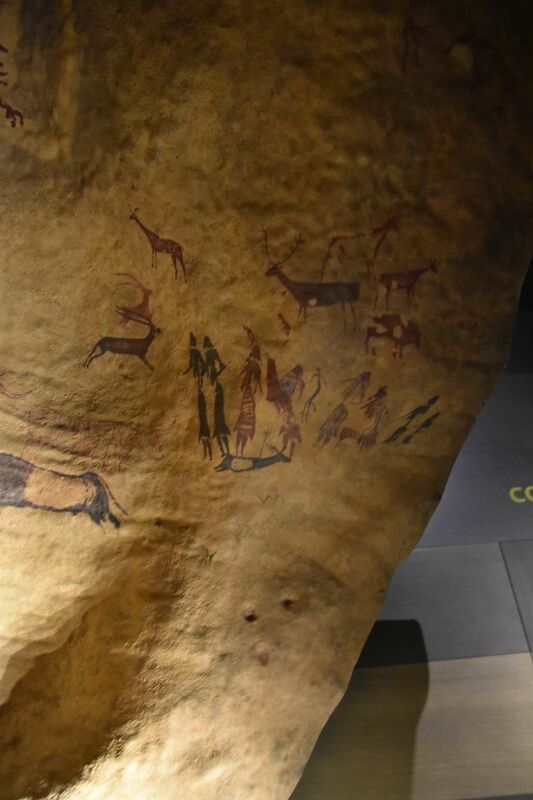 Not far from Lleida is El Cogul that is famous for its rock paintings called Roca dels Moros – but the paintings are, of course, much older than the muslim times. Archeologists concluded that this is a group of dancing women. El Cogul will be another day trip target, when returning to Catalonia (then I might also visit the wine region Costers del Segre nearby). 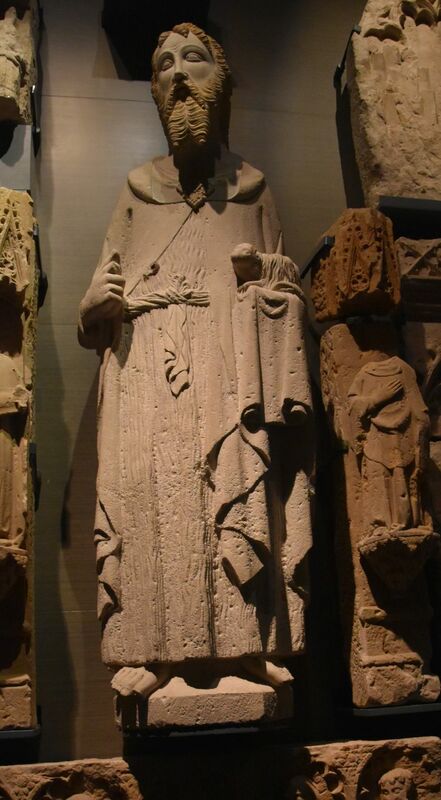 From the many marvellous sacral sculptures on display we liked this expressive figure of John the Baptist in full concentration with the small Agnus Dei on his left arm. 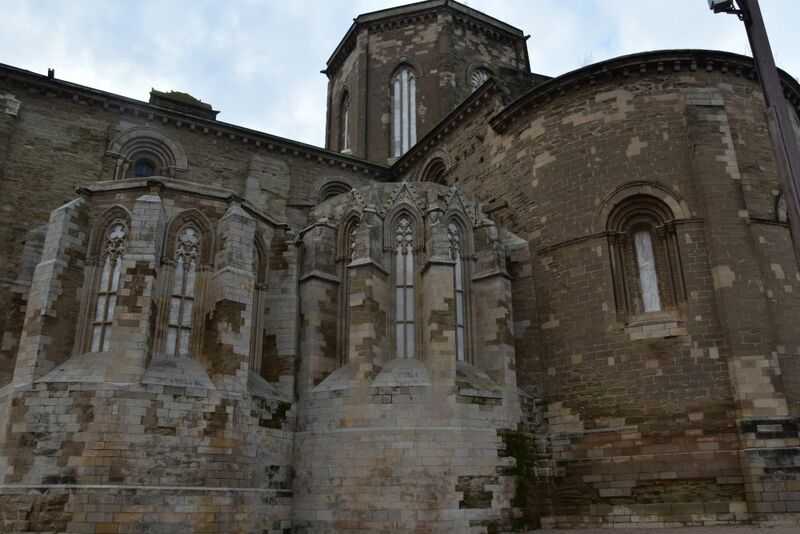 Near the museum we find the church Sant Llorenç from the 13th century, completed in Gothic style. I like the huge gargoyle against the dark blue sky… the fog has disappeared in the afternoon. Hm, I did not know, that bees are also good for therapy. The area around the Museum is much poorer than the Carrer Major. When, after the War of Succession in the beginning of the 18th century, the Bourbons transformed the castle hill into a military casern, they donated a new cathedral to the city, built in the then modern baroque style. 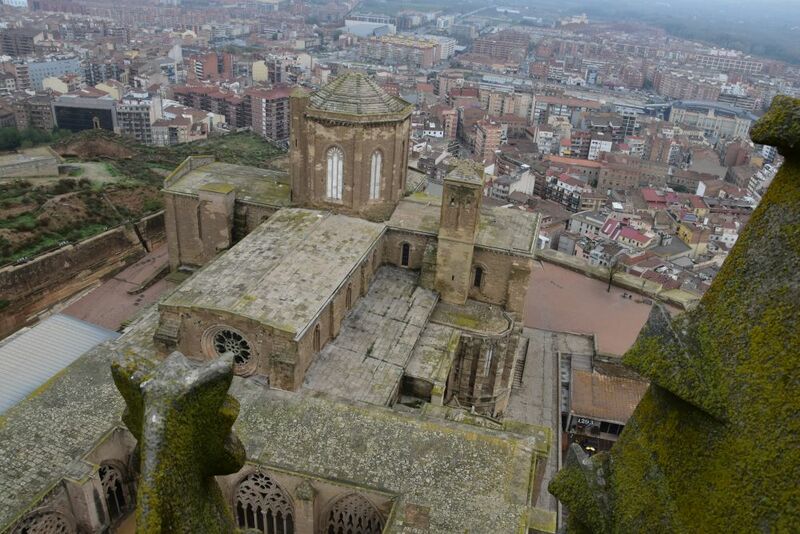 Since then, Lleida has owned two cathedrals which, however, have not always been ready for use. 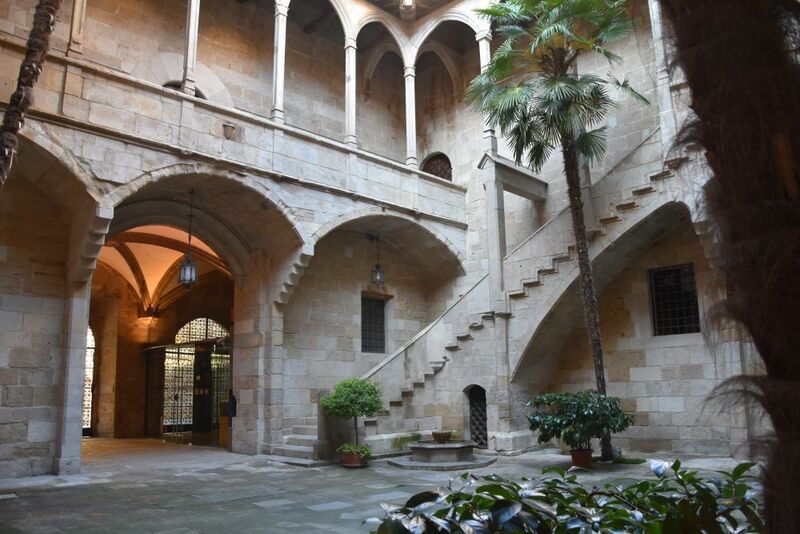 Just across we find the charming Gothic patio of the Hospital de Santa Maria. 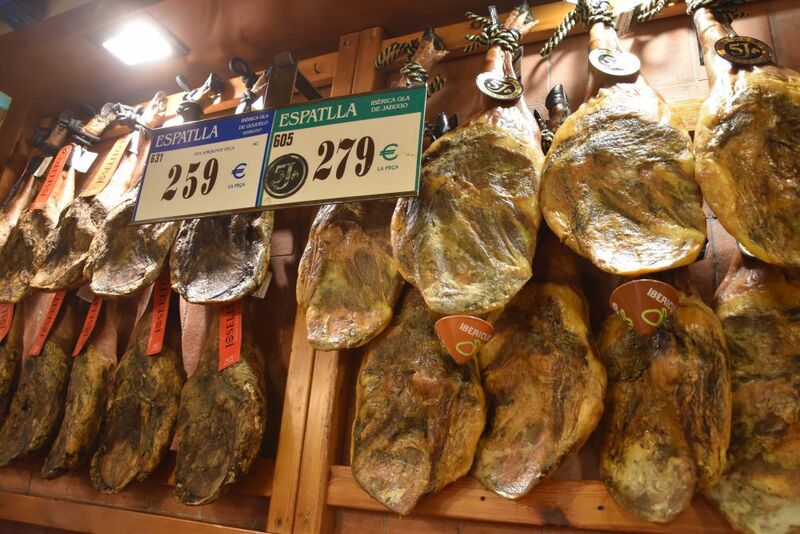 In between we take a coffee with a tasty, crusty ham sandwich in the Mesón Rincón Iberico. It is full of noble ham legs, amidst them the best from Jabugo labelled “5J”. I buy sliced ham to take home. 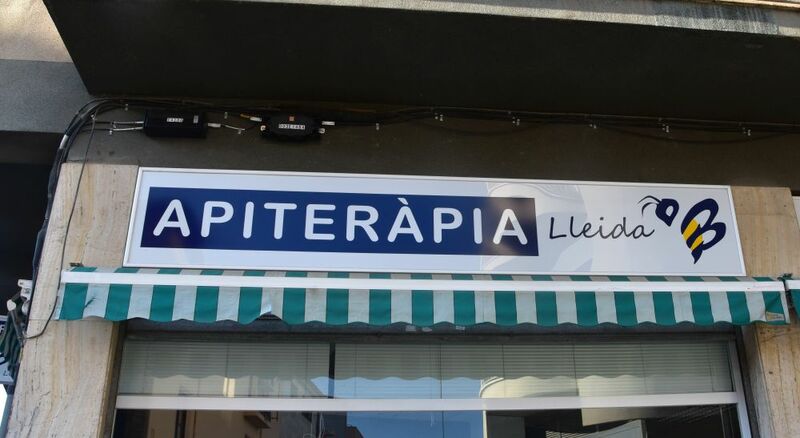 For lunch we find the quiet and cosy restaurant Romeu, where the menu costs 11.50 Euros – well worth the price. 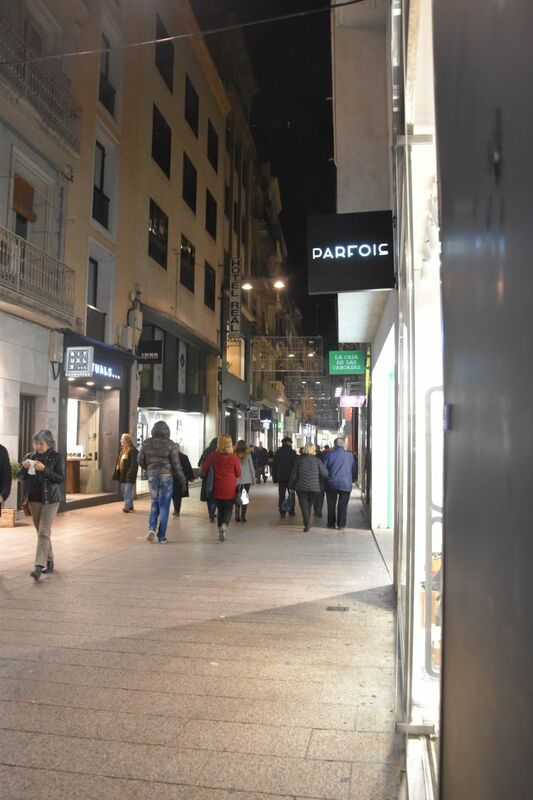 In the evening – it is now dark -we say good-bye to the lively Carrer Major. I manoeuvre my car out of the utterly narrow parking house (why are they all so narrow here?). Along the C-12 to Flix and Mora d’Ebre we return to our cosy apartment near Tarragona. When traversing Lleida the next time and fighting with the traffic lights and complex circuses, we might stop for a coffee in the Carrer Major.